3. Can be used for indoor, outdoor and joint. 4. Sold by set, with the material in the set, it can be installed easily. 1. Reliable insulation: the kit is made of imported liquid silicone rubber which has excellent characters of elasticity and insulation. 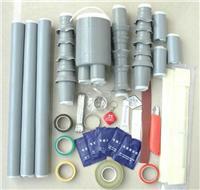 All the kits are Pre-moulded in factory: anyone unskilled can easily complete the installation. Needs no fire, save time. 3. Widely Application: Anti-dirtiness, aging-resistant, waterproof, excellent cold and heat-resistant character, suitable for high altitude, cold, dankish, salt fog and heavy polluted areas. Special suit for the petroleum, chemical plants and mine. 4. Advance equipment: The imported equipments have high automatism and reliable properties. 5. Excellent Appearance: with longer cold shrinkable tube, no commissural line. And smooth surface.